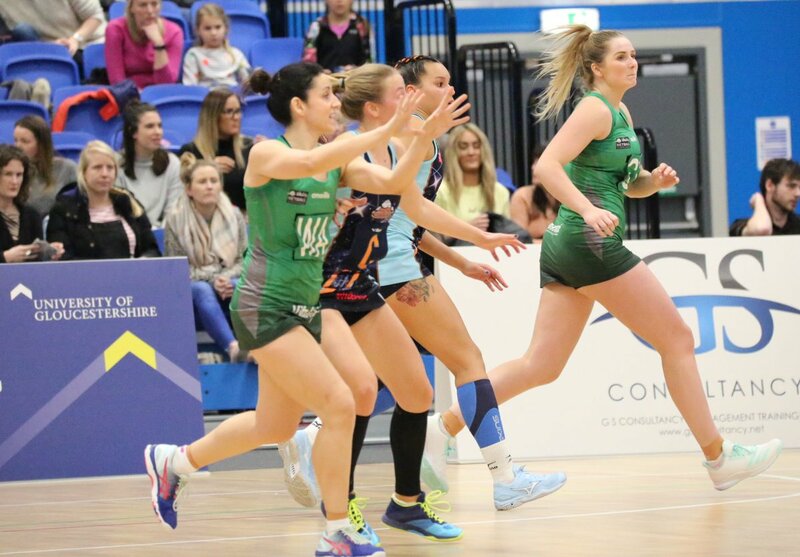 Celtic Dragons were ‘flat and flaky’ during their bitterly disappointing Vitality Netball Superleague defeat against Severn Stars in Gloucester. A sell-out attendance of more than 800 spectators watched Stars power to a 57-40 win against Dragons, who were a pale shadow of the team who crushed London Pulse 67-40 away in their last match. Coach Tania Hoffman was annoyed by the display, while captain Nia Jones said: “Not the game we know we can play. We expected better of ourselves individually, and will demand more of each other at training this week. “Not enough players stood up individually and we didn’t collectively perform. Wales international Georgia Rowe, from Caerleon, fires off a pass for Severn Stars against Celtic Dragons. Pic: CliveJonesPR. Dragons official website described the team display as ‘a flat and flaky show’. Hoffman opened with the same starting seven who were outstanding in London, but Stars won all four quarters. They led 11-8 after the first, extended that by four goals by half-time and swept to victory. It was a first win for Stars this season and Hoffman will demand a big reaction when they play Saracens Mavericks in Cardiff on Monday, February 4. Dragons won turnover ball, but could not capitalise in their attacking circle and Stars stretched their lead to complete a comfortable win in Gloucester. The tone was set from the first centre pass when Dragons lost possession and Stars surged five goals ahead. Dee Bolakoro shone during that opening period, but Stars had the edge and were far more clinical with their chances. Clare Elsley produced good creativity in mid-court to give Chelsea Lewis, but Dragons had no answer to outstanding South Africa shooter Maryka Holtzhausen. Her partnership with attacking partner Georgia Rowe, a former Dragon who is 6ft 5ins tall and from Caerleon, was too hot for the visitors. Dragons will now hit their training base at Cardiff Met hard this week with plenty to work on. Their first home game of VNSL 2019 will be on Monday, February 4 against Saracens Mavericks at the Sport Wales National Centre in Cardiff. Celtic Dragons: GS Chelsea Lewis, GA Kalifa McCollin, WA Suzy Drane, C Kyra Jones, WD Nia Jones (capt), GD Dee Bolakoro, GK Stacian Facey. Replacements: Abby Tyrrell, Claire Elsley, Lucy Herdman, Lucy Howells, Eleanor Roberts. Severn Stars: GS Georgia Rowe, GA Maryka Holtzhausen, WA Iona Darroch, C Lucy Harris, WD Ella Powell-Davies, Jodi-Ann Ward, Sam Cook. Replacements: Hallmat Adio, Beth Gabriel, Cara-Lea Moseley, Shona O’Dwyer, Paige Reed. Friday results: Saracens Mavericks 64, Loughborough Lightning 51; Severn Stars 57, Celtic Dragons 40. Saturday, January 26: Manchester Thunder v Strathclyde Sirens (5pm), London Pulse v Wasps (7pm). Monday, January 28: Team Bath v Surrey Storm (7pm, live on Sky Sports). Dragons fixtures 2019 – home games played at the Sport Wales National Centre in Cardiff.